When your job is to write about everybody, you’re allowed to have a favorite team. Still, you need to be objective, and it’s bad form to write about that team too often. So a workaround is writers will identify favorite players and favorite themes. A favorite FanGraphs player and theme is Mike Trout. You might’ve noticed. But I personally have my own assortment of favorites, and among them is the super-weird Vance Worley. I love any opportunity to write about him, and wouldn’t you know it? Worley’s back, and he’s thriving like he did when he was a rookie. Worley isn’t a guy who used to be fascinating. Worley is a guy who’s back to being fascinating. And you’ll remember the Pittsburgh Pirates got him pretty much for free. There’s an argument to be made that Worley’s been the best starter on the team, and while he’s not the most talented starter on the team, the numbers are compelling. Worley’s certainly been good enough to have fit with the Minnesota Twins, which dealt him in March. Vance Worley now is doing what he used to do, only now he’s doing things even better. And now he’s in a perfect situation for success. Among big-league starters, Worley’s allowed the second-highest contact rate, below only Scott Carroll. Eight of nine swings against Worley have made contact. Yet Worley has a strikeout rate comparable to Michael Pineda. He’s comparable to Jorge de la Rosa and Jered Weaver. 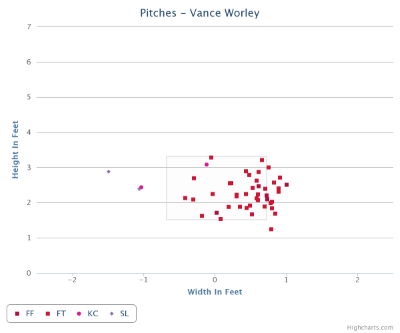 Worley is not a strikeout pitcher, but he’s a lot more of a strikeout pitcher than he ought to be based on his contact profile. And it’s all because Worley is back to racking up the called third strikes. When he was successful with the Philadelphia Phillies, this was one of his things. Over those two-plus seasons, 55% of Worley’s strikeouts were called. This year as a Pirate, 63% of Worley’s strikeouts have been called. The National League average for a starter is 26%. Worley doesn’t get swings and misses. Worley still gets strikeouts. Batters just don’t offer that much, relatively speaking, at Worley’s two-strike pitches in the strike-zone vicinity. Let’s look at pitchers league-wide, setting a minimum of 1,000 pitches thrown. There are nearly 250 such pitchers. Worley’s tied for the fourth-lowest rate of two-strike pitches that have gone for swinging strikeouts. He’s around 7%. The leader is Kenley Jansen, at 26%. How about if we sort by the rate of two-strike pitches that have gone for called strikeouts? That’s not just a lead — that’s a massive lead. One of every eight two-strike Worley pitches has been a called strike three. 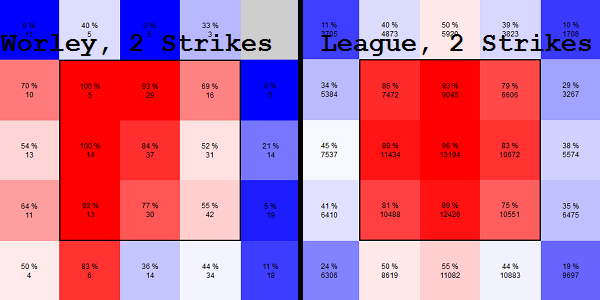 Here are some heat maps, showing swing rates in two-strike counts. On the left, 2014 Vance Worley. On the right, 2014 baseball. You can see where the differences are. When he was messed up with the Twins, Worley wasn’t nearly so deceptive. With the Phillies, and now with the Pirates, there are hints of sustainability. If batters were going to adjust, you’d think they would’ve adjusted. This appears to be a skill. Worley has just about mastered that running fastball on the edge. He’ll use it as a front-door weapon and a back-door weapon, and though it seems like maybe hitters should be better prepared for this, it’s not like Worley throws that pitch all the time. He has another fastball, and he has a couple breaking balls, so it isn’t that simple. There’s also the matter of the pitch looking like a ball until one of the final moments, so it’s relatively hard for a batter to commit to a swing. While you do want to defend the zone in a two-strike count, hitters also don’t want to be over-aggressive. Kind of similar to Jake Arrieta, Worley steps behind a righty, but you can also see that the ball is hidden behind his head. So righties get a late look, and lefties don’t have it that much better. And then when Worley targets the glove-side edge, he’s throwing across his body and it seems like the ball is coming in at a more exaggerated angle. It looks like it’s going to miss the zone until the ball changes its mind. I’ve never stepped in against Worley, so I’m not sure how the baseball really looks, but the results seem to speak for themselves. Worley’s throwing 87 mph to 90 mph fastballs for strikes and hitters aren’t swinging. What helps put Worley over the top is the fact that, in Pittsburgh, he throws to Russell Martin, who’s the best receiver he’s had. He’s certainly a far better receiver than Worley had in Minnesota. That means Worley gets to expand the boundaries even more, which would lead to more called strikes and strikeouts. Whether Martin returns to the Pirates for 2015 is a question, and I suppose the same goes for Worley. But he’s a guy who could really benefit in particular from having a good framer, and I suspect the Pirates know that. Vance Worley was once a fascinating pitcher, and after a year of absolute misery, he’s back to being himself. As far as the rest of this year is concerned, it’s unclear how the Pirates intend to use him, and it’s unclear where Worley’s career will take him from here. The most important thing, though, that Worley’s back on track as one of the more unusual starters in the game. Worley’s deception doesn’t make him an ace, but his deception is what makes him a big-leaguer. He’s got that deception again, and it’s giving fits to even the best hitters. We hoped you liked reading Return of the Most Deceptive Pitcher in Baseball by Jeff Sullivan! I feel bad for those hitters. That Gif of the strike out vs Miami is hilarious. He is walking towards the dugout before the ump calls it. Touche, Vance. Heh, that’s the one where it’s the most obvious and demonstrative, but it looks like he’s expected the K in each .gif. He clearly knows his distinctive skill well. That GIF against Rizzo was like a flashback to a vintage Oil Can Boyd back-door screwball. 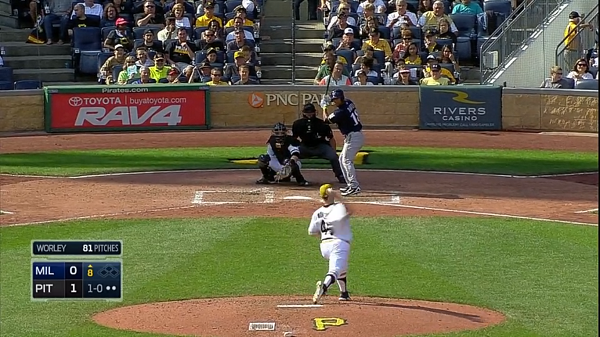 Seriously, that pitch alone made Oil Can worth watching. I’ll have to try to catch Worley pitching to see this in action.